Assemblages of microorganisms (bacteria, fungi, and algae) growing on the streambed and other surfaces are called biofilms. Biofilm formation involves the conditioning of surfaces by macro-molecule sorption, followed by the attachment of bacteria, the production of a polysaccharide matrix and the development of the biofilm itself, including the growth and later detachment of autotrophic and heterotrophic microorganisms (Fischer 2003). Biofilms are embedded in an exopolysaccharide matrix produced by microorganisms and forming on surfaces of stones, sediments, plants, decaying wood and leaves, and on suspended particles in larger rivers. This matrix binds together algae, bacteria, fungi, detrital par ticles, various exudates, exoenzymes, and metabolic products in an organic microlayer (Figure 7.13). Additional organic compounds, including proteins, nucleic acids, and humic compounds also occur in the matrix (Sinsabaugh and Foreman 2003). Energy transformations within biofilms include the conversion of light to chemical energy by algal photosynthesis, adsorption and microbial uptake of heterotrophic C, and internal transfers due to extracellular release and cell lysis. Both autotrophs and heterotrophs are likely to benefit from the internal fluxes of this highly symbiotic association. Properties of the polysaccharide matrix of the biofilm have the potential to influence energy and mineral transfers. By reducing diffusion rates, the organic microlayer tends to retain and concentrate compounds, particularly those of higher molecular weight. In addition, the polysaccharide matrix can act as an ion exchange system, attracting and binding charged organic molecules, anions, and cations (Lock 1981, Lock et al. 1984). DOC is adsorbed by the matrix and later diffuses into the biofilm, where it can be used by microorganisms. LMW organic compounds can be taken up directly by bacteria from above or within the biofilm, whereas larger molecules require hydrolysis by extracellular enzymes prior to bacterial uptake (Pusch et al. 1998, Fischer 2003). Exoenzymes and enzymes derived from cell lysis may be retained and remain active, facilitating the release of molecular products. The accumulation of exoenzymes within the microlayer permits surface film bacteria to divert resources from enzyme synthesis to microbial growth, thereby reducing energy demands on microorganisms for enzyme synthesis. Sampling of biofilm from the surfaces of stones (Sinsabaugh et al. 1991) and organic substrates (Golladay and Sinsabaugh 1991) has documented that exoen-zyme accumulation occurs as suggested under the Lock model. This has the beneficial effect that enzyme activity can be spatially distant from the microorganisms that produced the original enzymes, enhancing the availability of organic C to microorganisms and helping to maintain growth in an environment where C and nutrient sources are variable (Pusch et al. 1998). Under environmental conditions that favor a well-developed algal component of the biofilm, such as stony substrates receiving ample light, heterotrophic bacteria benefit from the presence of algae. Periphyton can provide substantial amounts of dissolved organics for bacterial uptake (Kaplan and Bott 1982) and probably are responsible for secreting most of the "slime" structure. Geesey et al. (1978) found that measures of bacterial biomass (ATP) and periphyton biomass (chlorophyll a) in the epilithon fluctuated together, and suggested that bacterial populations were dependent upon the periphyton for their establishment and maintenance. An evaluation of 69 streams from sites in Kentucky and Michigan using algal biomass, DOC, and nutrients as possible predictors of bacterial cell density found that algal biomass was the best predictor, but the relationship was not evident at low algal biomass (Rier and Stevenson 2001). Although biofilms can develop both in the light and in the dark, and thus on the undersides of stones, within the sediment profile and even within caves (Simon et al. 2003), biofilm structure and function exhibit distinct differences between light and dark environments. Comparison of a biofilm in an open channel to one inside a dark pipe within the stream channel documented greater DOC uptake in the former (Romani et al. 2004). The light-grown biofilm supported greater biomass and activity of bacteria due to its higher algal biomass, exudates, and development of a polysaccharide matrix. The dark-grown biofilm, in contrast, was highly dependent on the supply and quality of OM and was more efficient in the uptake of labile molecules. Indeed, labile DOC from streamwater may play an important role in bacterial growth during initial colonization, while DOC from algae may enhance bacterial growth at later stages of biofilm development (Sobczak 1996). Biofilms readily develop on the surfaces of leaves and wood. Microbial biomass and exoen-zyme accumulation were greater on wood (icecream sticks of white birch) than sugar maple leaves in a boreal river in upper New York State (Golladay and Sinsabaugh 1991), suggesting that wood may be an important site of biofilm development in streams. McNamara and Leff (2004) tested the response of several bacteria species to leachate from sugar maple leaves at various stages of decomposition using an agar substrate that allowed the leachate to diffuse through filters on which bacteria were enumerated. Species differed in their response to components of leaf leachate such as tolerance to phenolic compounds, demonstrating how the composition of microbial assemblage can influence its ability to utilize the mixture of labile, refractory, and inhibitory compounds. Measurements of uptake of tree-tissue leachate in streambed sediments within recirculating mesocosms found that most DOC was bioavailable, and by extrapolation to bacterial demand for DOC in White Clay Creek, Pennsylvania, could support up to half of community respiration (Wiegner et al. 2005). Tank and Webster (1998) reported higher micro-bial respiration, fungal biomass, and extracellular enzyme activity in wood biofilms in a litter-excluded stream compared with a reference stream, suggesting competition for C or nutrients between microorganisms associated with leaf and wood substrates. (glucose, leaf leachate, and algal exudates) and inorganic nutrients (nitrate and phosphate), and these response patterns vary seasonally (Olapade and Leff 2005). The greatest response was to glucose, a highly labile, LMW form of DOC. Extracellular enzyme activity of hyporheic bacterial communities was also greatest when treated with labile DOC (glucose, bovine serum albumin), compared with refractory (tannic acid) and natural (leaf leachate) DOC sources (Findlay et al. 2003). Microbial response to terrestrially supplied DOC supports expectations that DOC bioavail-ability varies with catchment vegetation and flowpaths. 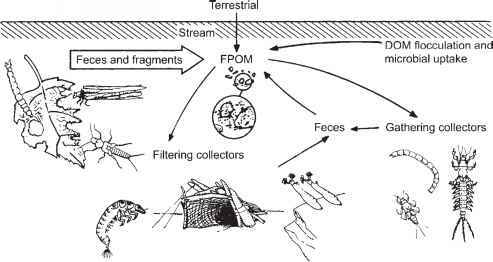 Benthic microbial communities in streamside microcosms along a forested stream responded immediately and positively to increases in terrestrially derived DOC, and more so to DOC extracted from upper soil horizons than from deeper soils (Kreutzweiser and Capell 2003). Findlay et al. (2001) compared water draining from pasture, native forest, and pine plantation in the Whatwhata catchment on the North Island of New Zealand to evaluate the effects of catchment vegetation on the ability of DOC to support bacterial growth. Water from the pasture surface flowpath supported twice as much bacterial production as pasture ground-water, and differences among the three vegetation types were detected from surface flows but not from groundwater. Nutrients may limit microbial production when an abundant C source supports high mi-crobial production. Microbial respiration on wood biofilms increased in response to nutrient addition in a reference stream but not in a litter-excluded stream, suggesting lowered nutrient immobilization and thus higher nutrient availability in the absence of decomposing leaf litter and its microbial flora (Tank and Webster 1998). A comparison of nutrient limitation of biofilm algae and fungi in ten streams in North America found that fungi responded more to nutrient addition than did algae, although for both auto-trophs and heterotrophs, N limitation was more common than P limitation (Tank and Dodds 2003). Using streamside flumes to observe biofilm development under slow and fast current velocities, Battin et al. (2004) found that slow velocities favored thicker biofilms in which internal cycling of C was more important, based on DOC uptake and microbial growth rates. Manipulation of substrate heterogeneity resulted in an immediate and significant increase in the respiration of the benthic biofilm of a Virginia piedmont stream, probably due to changes in near-bed flow velocity and turbulence intensity (Cardinale et al. 2002b). Biofilm studies have focused primarily on surfaces that have some contact with current, and less is known about the role of biofilms within the sediments and into the hyporheic zone. Permeability of the sediments and the hydraulic residence time of the infiltrating water will strongly affect how much water column DOC exchanges with pore water. Battin (2000) showed that water velocities affected transport of solutes into surface biofilms, and higher velocities helped overcome diffusional limitation of material exchange. At least in some instances the availability of POC rather than infiltration of DOC is likely to determine hyporheic microbial metabolism (Brugger et al. 2001). A synthesis of numerous studies of bacterial production documented a significant positive relationship with the amount of OM in the sediments (Cole et al. 1988). Findlay et al. (1986b) reported daily bacterial production to be an order of magnitude higher in sediments of backwater areas than in sandy regions of two blackwater rivers of the southeastern United States, corresponding to differences in organic content between sites. Similarly, bacterial production was higher in an Appalachian mountain spring (Crocker and Meyer 1987) and in a Pennsylvania stream (Kaplan and Bott 1989) than in the two blackwater rivers, and sediment OM content also was higher at the former sites. will vary with the supply of each, and with hyporheic flowpaths and water residence time (Findlay and Sobczak 2000). Within the hypor-heic interstices of the Toss River, a gravel-bed stream in Switzerland, highest bacterial production occurred within interstices dominated by surface water inflow, and an attenuation of bacterial abundance was observed in deeper sediment strata (Brunke and Fischer 1999). The abundance of several hyporheic invertebrate taxa, taxon richness, and total invertebrate density correlated with bacterial abundance and production, indicative of a consumer response to resources. In the Spree River, Germany, bacterial production rates in the sediments (1.3-5.4 |g C cm—3 h—1) were nearly three orders of magnitude higher than in the water column (0.9-3 9 |g C L—1 h—1), and bacterial respiration was sufficiently high to metabolize a large proportion of the organic C retained in the sediments (Fischer and Pusch 2001). To evaluate the influence of hyporheic flowpaths on the availability of streamwater DOC within the sediments beneath the streambed, Sobczak and Findlay (2002) sampled DOC and oxygen concentrations in wells located along transects on gravel bars, where down-welling of surface water was indicated by negative hydraulic gradient (Figure 7.14). About 38-50% of the surface water DOC was removed, and declines in DOC along the flowpath were accompanied by decreases in oxygen concentration and bacterial activity, suggesting that DOC removal was due to bacterial metabolism. 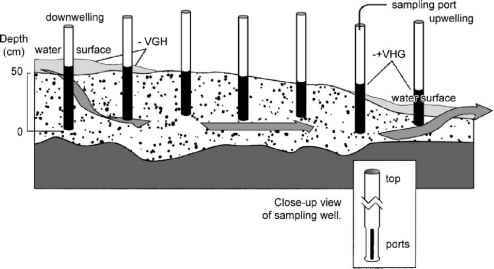 In lowland rivers where sediments tend to be finer and water circulates less freely, microbial metabolism within the streambed is likely to show a vertical profile, more so if the sediments are vertically stratified and less so if they are shifting. Based on the rapid turnover of organic C in sediments, Fischer et al. (2002) concluded that sediment dynamics significantly foster organic C metabolism in lowland rivers and thus strongly influence the metabolism of the whole ecosystem. Comparing biofilms growing on stones and on sandy substrata in a Mediterranean stream in northeastern Spain, Romani and Saba-ter (2001) observed higher extracellular enzymatic activity in episammic compared with epilithic biofilms, indicating the much greater availability of POC in sandy substrates relative to gravel, and the likely importance of sand habitats to OM processing.